Star Wars fan Craig Stevens has been collecting the action figures from the series since he was a child. He’s noted for posing them in stunning dioramas, including one that arrays hundreds of Storm Trooper figures. It will be terribly heart wrenching to see my items sold but I am sure that each one will go to a very good home and be protected and cherished by my fellow collectors. With so few mint-on-card figures surviving to the present day in perfect condition, preservation must be a high priority. With Vectis taking care of the auction, I am confident that my collection will be passed to the very best hands. 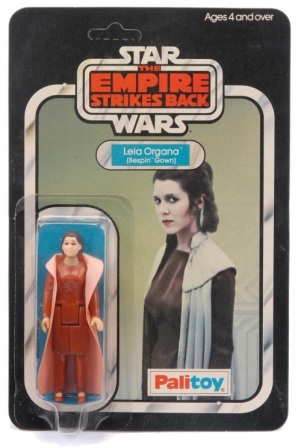 A list of available items is here and it all seems a jolly amble down memory lane — figures of Luke Skywalker and Leia Organa, Lando Kalrissian, Boba Fett (the list goes on) – til you get to the Palitoy Star Wars Death Squad Commander, which sounds like something Draco Malfoy finds in his Christmas stocking. This entry was posted in Like Show Business and tagged auction, Star Wars by Mike Glyer. Bookmark the permalink. I love collectable junk like this … but usually not enough to get serious about it, and spend money on dozens of identical storm troopers just so I can line them up parade-ground fashion. Essentially, though, its the same when I invest money in a 14th century dinar, or 1/18 diecast replica of a 1954 Nash Ambassador four-door. And some people say that we should be more spiritual! Clearly, they haven’t learned the joys of materialism, and mistakenly believe its about a bigger widescreen TV or the latest iPhone.